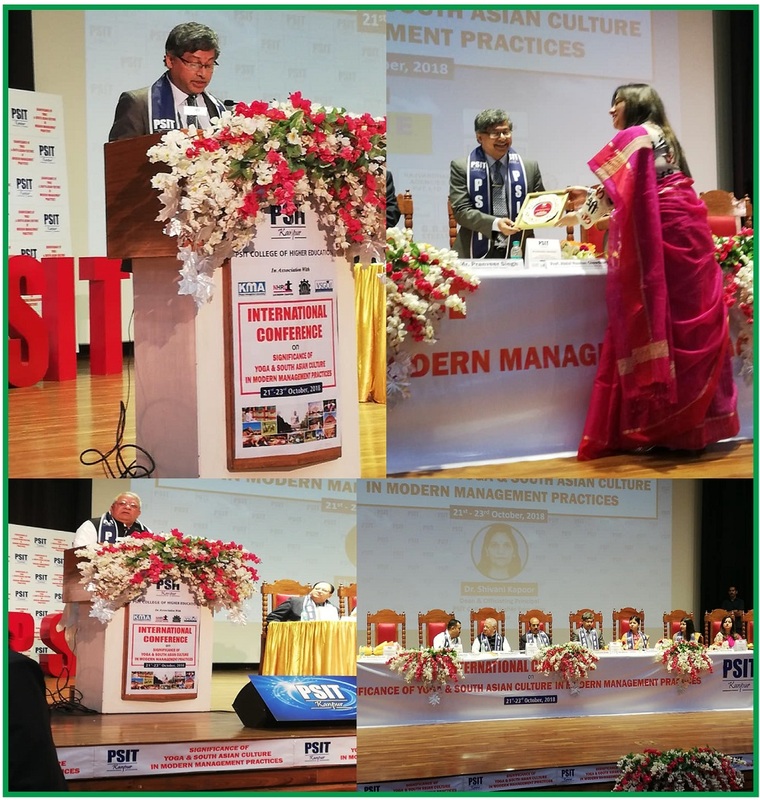 Prof. Dr. Abdul Hannan Chowdhury, Vice Chancellor of Primeasia University was invited as a Guest of Honor at the International Conference on “Significance of Yoga and South Asian Culture in Modern Management Practices” at Pranveer Singh Institute of Technology (PSIT), Kanpur, India where BJP senior leader and member of Parliament, Mr. Kailash Mishra was the Chief Guest at the inaugural ceremony. The Conference was organized by the PSIT School of Higher Education. Among others Mr. Pranveer Singh, Chairman of PSIT, Prof. Neelima Gupta, Vice Chancellor of CSJM University, Prof. O. P. Shukla, Principal of National Defense Academy, Pune, Prof. Mazar Naqvi, Director General, VSGOI, Kanpur, Ms Shefali Raj, Managing Director, PSIT and Dr. Shibani Kapoor, Dean of School of Higher Education of PSIT were present in the Conference. Vice Chancellor of Primeasia University, Prof. Dr. Chowdhury said that this Conference would provide an opportunity to wide range of practitioners. He said that yoga teaches us to have patience and tolerance. He said that it builds harmony in mind and body. He pointed out that South Asia region has wide range of cultural history, heritage, belief and it encompasses a wide area. Emphasizing current research he added Hofstede’s Five Dimensions (Small vs. Large Power Distance; Individualism vs. Collectivism; Masculinity vs. Femininity; Weak vs. Strong Uncertainty Avoidance and Long vs. short term Orientation) of cultural impacts on organization and how society handles those. He said that there was a change in culture due to digitization, rapid connectivity and different modes of engagement. He said that there was a need for collaborative education; talents across the region must be nurtured. At the closing ceremony, among others Shree Sripad Naik, Ministry of Ayush, Government of India was present as the Chief Guest and Dr. Murali Manohar Joshi, MP was the Guest of Honor. Dr. Chowdhury made a Speech on the Closing Ceremony. The program was widely covered by the Indian Print and Electronic Media. Copyright © 2016-2017 PRIMEASIA UNIVERSITY. All Rights Reserved.